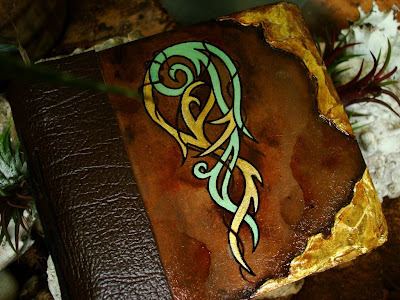 ahhhh .... in my LOTRs mood once again :) painted another "coaster" book which i named "book of lorien" inspired by lothlorien, home of galadriel, the keeper of nenya ~ ring of water ... that's how the motif on the front cover came about. i fell in love with it as soon as i finished designing it. it's one of those things that look just perfect, no erasers needed :) although i did contemplate for quite a while on the colors :) but finally decided on pale gold and metallic turquoise to signify the nature of nenya (water). 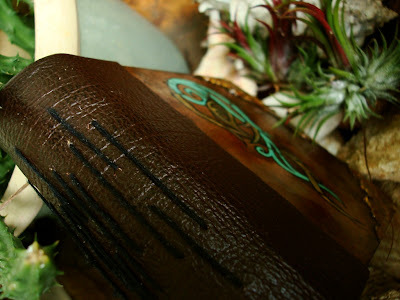 the spine of lorien is leather and the signatures (there are 11 signatures of 10 pages each) are hand sewn onto the leather with double thick black thread. 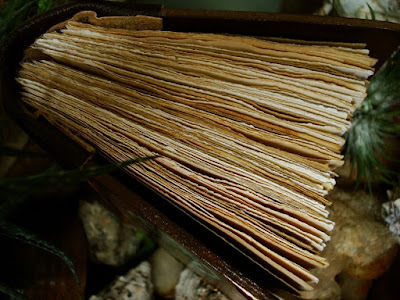 the heart of lorien is filled with my tea-stained papers, all hand torn. however to create more variety in the pages, for every 8 pages of tea-stained paper there are 2 pages of brown recycle paper. 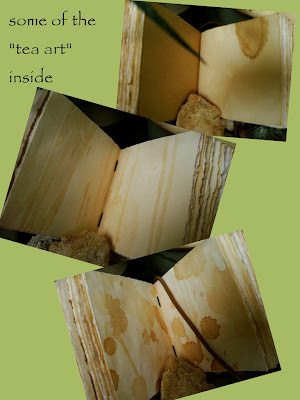 i just cannot stop looking inside the book because every page i turn, it's like a delightful surprise ... the tea stained papers are such intriguing materials ... it's like art on its own, and art that is so organic (sorry for the pun ... everyone knows i stained the papers with expired organic tea bags!!). what i mean by organic here is the way the pattern happens. it's so natural and un-choreographed ... it's how the tea decide to trail, where the teadrops decide to land and how they wanna splatter! so pretty! well ... to me at least, but then again, i'm weird ... my mom would probably frown at the "dirty" papers!! LOL~! blog party ~ 5 degrees of inspiration! "i feel like i could really find one in middle earth"
from you :) really really appreciate it! Love your book and the tea stained pages. 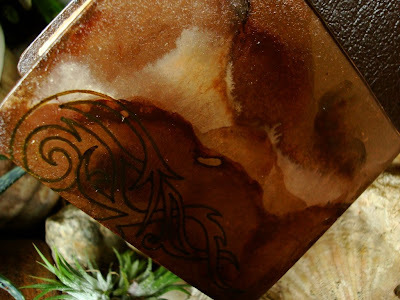 Thank you so much for stopping by my blog and leaving such positive comments. See you at the party on Aug. 1. It's gorgeous Luthien!! I love your design and the idea behind it!! thank you very much :)) oh yea!! see ya! I would love this even if I wasn't a LOTR fan, but since I am, I love it even more! Seriously, it is gorgeous. it will be on it's way to you tomorrow :))) HUGS!! Wow! I love your books and this one is awesome. I love LOTR and all things ancient and celtic. WOW, what you've created looks ancient and charmed, very beautiful inside and out!!! thank you for visiting me and thank you for the wonderful comment!! LOTR rules!! thank you very much! your comments mean so much to me! !